The Eagles found themselves in a 12-point hole during the opening quarter after a slow start shooting the rock. The Skyhawks took advantage of the 4-of-17 start by the host team to pull ahead 25-13 with 1:48 remaining in the first. Morehead State managed to run off six consecutive points from the free-throw stripe to pull within six points after the first 10 minutes of play. Morehead State continued to find its footing on offense in the second quarter, knocking down 9-of-15 shots from the field to cut the lead to 43-41 at the halftime horn. "I think our team relaxed after the first quarter," said Eagles' head coach Greg Todd. "It took us awhile to find our shot but we managed to win the final three quarters and ultimately pull out win over a good UT Martin team." Morehead State and the Skyhawks traded hoops over the first four minutes of the third before the Eagles seized the lead at 51-49 on a Miranda Crockett layup with 5:25 remaining in the quarter. MSU never looked back after grabbing the advantage and led the final 15:25 of the game. Morehead State senior forward Tierra McGowan cleaned the glass for a season-best 17 rebounds and deposited 18 points to earn her first double-double of the 2018-19 campaign. McGowan went for 12 points and 10 rebounds in the second half alone. Graduate forward McKenzie Calvert netted a game-high 22 points and dished out five assists to help in the winning effort. The senior Crockett posted 15 points and moved her double-digit scoring streak to 24-consecutive games. Junior guard Aliyah Jeune, who entered the game leading the OVC in scoring with an average of 19.5 points per game, also posted 15 points and made three shots from deep. "It's great when you're able to win when your top-two scorers are held in check " added Todd. "McKenzie (Calvert) and Tierra (McGowan) really stepped up when we needed them tonight and I think that just shows how versatile our team is." The win was Todd's 77th win as the bench boss and moved him past former Eagles' coach Laura Litter (1997-2005) for third in all-time wins in the Morehead State record book. UTM head coach Kevin McMillan held a record of 148-2 when leading at halftime before being knocked off by the Eagles. McMillan's squad dropped to 12-5 overall on the season and 4-2 in the OVC. 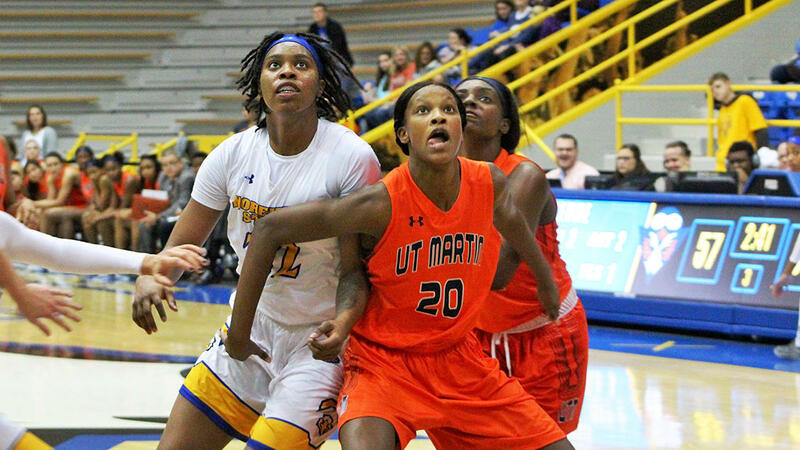 The Skyhawks were paced by junior forward Aundrea Adams with 16 points. Adams came off the bench and knocked down a game-best 12 free throws. Morehead State will look to win its fourth in a row when it welcomes Tennessee Tech on Thursday. The game between the Eagles and Golden Eagles is scheduled to tipoff at 5:05 p.m. ET.